* 150 Meg WiFi, Cable & Netflix TV - Free! * Ice-cold welcome drinks in fridge - Free! Baan Leelawadee is a delightful luxury villa with a fabulous 13m x 8m private pool and jacuzzi in a sought after, breezy location on the prestigious “Pattaya Hill Village 2” gated development. It has had a 65,000 Euro total refurbishment that was completed in 2016. The area is large 560 m2 in total with 220 m2 internal area on a corner position with off street parking. 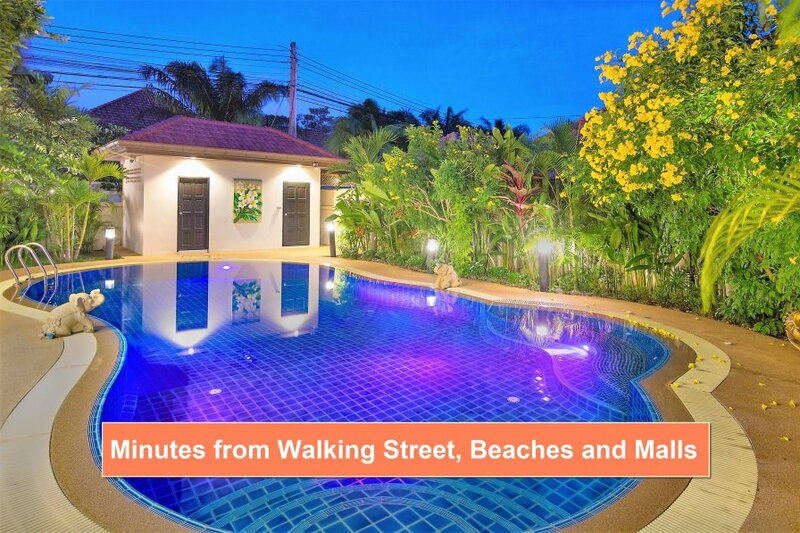 It is only 10 minutes away from central Pattaya with its great shopping malls, famous nightlife, Walking Street, street markets, golf courses and beautiful beaches. It can comfortably take 8 guests in 4 large bedrooms with one king and 3 queen sized beds, and has 3 toilets/showers/bathrooms. Leelawadee is the name of the small beautiful flower seen all over Thailand and signifies the beauty and comfort of this villa as a vacation home-from-home. It has been done to a very high standard with quality new furniture and furnishings throughout. It has been tastefully decorated and has contemporary paintings in each room. The spacious 9m x 9m L-shaped living room has high vaulted ceilings which creates an open and airy feel. The large 8m European style kitchen is fully equipped with all new utensils, a large fridge/freezer, gas hob cooker, oven, rice cooker, toaster, expresso coffee machine, coffee maker, microwave, washing machine, dishwasher, waste disposal unit and a safe. The villa has 4 large double bedrooms each with a luxurious 5* hotel pocket sprung mattress, duck feather & down pillows, a wardrobe, bedside tables with lights, mirror and curtains with tie-backs. There are 2 inside bathrooms each with a toilet, shower and new black granite tops and an outside shower, sink and toilet by the pool. The master bedroom bathroom has an en-suite with 2 sinks, walk-in shower and a large bath. It also has a 50" smart TV with cable, built-in wardrobe, chest of drawers and a dressing area with tall mirrors. All of the villa’s rooms are equipped with new quiet air conditioning units and silent low-energy ceiling fans as well as mosquito nets to ensure a good night’s sleep. The living room has a 50” TV with cable TV providing 250 channels and high speed 150 meg fibre WiFi internet with extender to the pool area. It has a large 3-seater couch with 2 single matching armchairs and a marble coffee table. The dining room has a large stylish dining table and 6 chairs. Outside is the fabulous new private pool and Jacuzzi (size 13m x 8m) with toilet and shower. Around the pool is a tropical garden that has a mixture of mature plants, palms, flowers and trees. The outside dining area has 8 chairs and table with relaxing loungers by the pool. It offers plenty of shaded seating with a wall-fan and outside spot lights, perfect for a relaxing evening BBQ. There is lovely tasteful lighting both in and around the pool and gardens. There is off-street parking in the car port with security gate and CCTV. The estate has 24×7 gated security and night patrols. The estate is located just off a main road which has plenty of good restaurants and fine bars including Murphys just opposite (the best Irish Pub in Pattaya), mini-markets, fresh food markets, a German bakery, ATMs, a brand new shopping mall, massage spas, hairdresser and beauty salons, all just a few minutes walk from the villa. A new shopping mall has opened with a fine food Topps European supermarket just 10 mins walk away. Apart from the beaches, shopping malls and Walking street only 10 mins away there is the World famous Siam Country Club international golf course which is less than 10 minutes drive away.